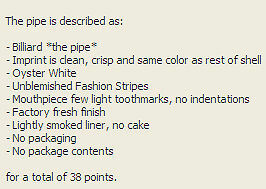 The value of pipe #429 is 38 points. David Epstein offered an unsmoked featherROCK on eBay and mentioned he had come by it when he had done some jobbing for Venturi in the 70's. Of course, I wrote him before the auction ended to ask about his experiences and, from the correspondence, it developed that he had three more pipes, 2 Venturi and 1 the pipe that were his samples. When I won the auction, we made a deal for this one and the other three - all un-smoked and factory fresh. The two Venturis will join the collection and their predecessors will go to the Pipes for Sale page. the pipe is a true All-American which I did not have in the Billiard shape,so it will also join the collection. Eventually a NIB unsmoked example of this color/shape with literature and mouthpiece price sticker came my way so this one is now available on the Pipes for Sale page.